Monday's Sustainability Communications Lunch was an enthusiastic debate on the participants’ communications highlights from 2012 and goals for 2013. The group is made up of communicators from businesses, trade associations and NGOs working on sustainability-related issues. So what did we learn? We looked at how to keep the momentum going both internally and externally from communications around events, for example launches of reports and initiatives. We all know that it can be tough to keep the buy-in after the launch. And yet these launches can be used as hooks on an ongoing basis, for member relations, the media and wider stakeholders. One member of the group sends a questionnaire after big events as well as targeted follow-up with calls to action for top tier contacts. Building a community can be a challenge, but once it’s done, it can be a credible and interactive tool. Members of trade associations and other stakeholders can serve as effective multipliers. The main challenge seems to be to persuade and engage co-workers and stakeholders. Justifying the time spent in interacting on social media, for instance, might be difficult, but the general consensus is that there is real Return on Investment (RoI). The members of the group who are active on social media spend up to one hour a day blogging, tweeting and using Facebook. Monitoring and presenting metrics can be an excellent way to make your case and show the value, although social media is about more than numbers. One of the first elements of a communications plan is to define the audience. Communications tools should also be adapted to their targets and audiences. While NGOs are making the most of Facebook, companies or other organisations find it harder and might prefer to build their profile on LinkedIn or Twitter, at least at first. Using Twitter around press release launches, for example by sending a list of approved tweets for translation into the language of the local office is one way an NGO at the Lunch is helping spread the word. We all have a story to tell. Playing with the right blocks to build that story, being present and consistent and approaching from the right angle are approaches that will always pay off in the long run. 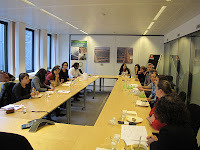 This was the 11th Sustainability Communications Lunch. If you would like to suggest a theme for future Lunches, please send us your ideas. The next Lunch will be on Monday 25 February (to be confirmed). Keep an eye on our Facebook page and our Twitter @Sustconsult for more details or contact lunch@sustainabilityconsult.com.